What’s the idea behind Outsiders? There are two brilliant ideas – I can say that since they weren’t mine. Bethan Gorman pitched a sitcom about characters from outside the UK living together here, tapping into both fish-out-of-water comedy and observations on modern Britain. The second idea was a production method: cast comedians, let improv drive the dialogue, reveal the characters and shape the stories. It gave us a fantastic starting point. 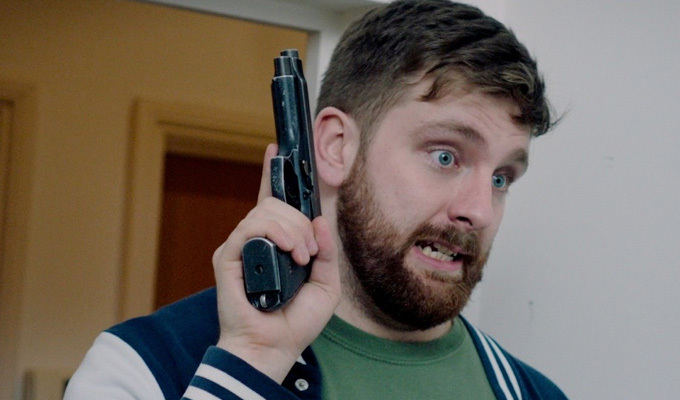 How do you pilot a 30-minute sitcom as shorts? They’re three five-minute sitcom episodes. I really didn’t want to just showcase jokes and characters, I wanted to make episodes. Risky compared to just letting a good riff run, but I’ve always held that narrative is free: if you have limited resources or an enclosed setting, at least twists and turns cost nothing. And we were so tight on budget that I had to cameo as a drunk since we couldn’t afford to hire one. But I’m also adamant that you can tell a good story in any amount of time. Commercials do it all the time. Music videos too. I wrote a short that won a 5-minute film challenge a few years ago, and since it was up against really cool, visually exciting shorts I’ve always assumed it was having a character you liked and a story that worked that did it for us. To tell a story fast, you need every character’s first lines to be on-point, to reveal who they are as quickly and cleanly as possible, so you know who you’re travelling with and why it matters. That’s what the Friends pilot did so well – four characters nailed in the first seven lines. I stuck to a pretty constant mantra, too, that you can grasp characters most easily if you see the differences – and the best way to reveal difference is give them a single topic to deal with. That’s where the gun came from: what are their different reactions to this deadly weapon in the house? Anne Henry, our producer, scouted around for the best up-and-coming talent. People we could look at and go: ‘I’d follow them through a series’. Every one of these performers would make a great lead in a show – which is great because it prevents you from writing anyone as secondary. It’s a proper five-hander. Crucially, though, I was looking for combinations. Personalities that, on camera, would definitely clash. There’s a kind of science to it. When we were casting, the question I kept asking is ‘What’s wrong with you?’ Because flaws are where you get character comedy. When someone tells you they like saying things just to create tension, or that they’d rather win an argument than be right, you know that’s fuel you can use. They also make up a bit of a family. There’s a definite strict mum/know-it-all dad/naughty teenager/crazy toddler/weird uncle shape to it. That’s not deliberate, but it does seem like a shape sitcom tends towards, even with workplace or flatshare settings. We have Sofie Hagen from Denmark, Mae Martin from Canada and Pierre Novellie from South Africa. Very different stand-up comedians, but they share a common core, a sensibility that comes from so much circuit experience. A work ethic and an urge to be funny and original. 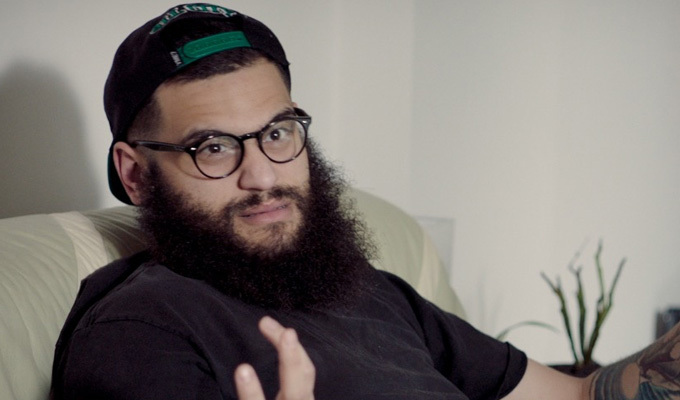 Then we have Jamali Maddix, who also has all that. But he’s a black guy from London, which makes him an outsider for different reasons – he’s the one local in a flat of foreigners. Jamali talks in his act about how his appearance gets him called ‘Bin Laden’ on the street. Unthinking people see him a certain way. Lousy for society, but really useful for our comedy. It totally fit the Outsiders vibe. Finally there’s Yasmine Akram, who’s Irish and half Pakistani. She’s more from the comedy-improv school. She came in with some really strong ideas, much more from an acting perspective first. I’ve mentioned nationalities and ethnicities, because it’s really important to the core concept of the show. But ‘Canadian’ or ‘black’ isn’t a personality, obviously, any more than our cast being three women and two guys makes this "a show about women". It’s about characters, and the specifics of each character really matter to us. In the end, like all sitcoms, it’s about not being content. Malcontents are funny. How did the Blaps take shape? I wrote stories, maybe five or six, and we picked the most exciting three. Then we had an improv workshop day, working each story through scene by scene. But more than that, we threw scenes out, found new ones, came up with different pairings and directions. One story basically died and a new one regrew out of what was little more than a background detail. We had a logger from Big Brother there the whole time typing everything that was said. 150 words a minute! This blur of fingers next to me as they talked – like a superpower. At the end of the day I went home with reams of verbatim dialogue. Then it got written, properly. All the best stuff – by which I mean all the funny, but also the things that really communicate character and situation – was shaped back into stories. Sometimes that meant the original shape, sometimes it’s about concluding the narratives we found on the day. And after some stress-testing – notes back, rewrites, exactly like any other script – that’s what went to the floor for shooting. The cast had scripts that we could be sure were in ‘their voice’ because in most cases it’s literally what they’d said. I think there’s just one line which moved to a different character, but even then I gave it a different punchline. So how much is written versus improvised? Watch it and see if you can tell! It’s an improvised show with a proper script. I tend to think those authorship percentages are a mug’s game. We found the characters together, the cast improvised everything from stories given to them, I made those into scripts, all based on someone’s else’s central idea. Throw in Dominic Brigstocke directing with a real grip on the material, a brilliant editor and smart producers making all the difference in the cut and… whose show is it? The closest comparison we’ve come up with is ‘What if Mike Leigh made a sitcom?’. What it definitely avoids, I hope, is that ‘try ten punchlines and pick one in the edit’ feel you get from some American comedy films. I like a lot of those – I’m mad for Paul Feig, who does it brilliantly – but I always think you can tell. You can see the actor reaching for the gag. You can feel the edits, performances slightly skip around, interactions don’t quite mesh. A fully-improvised-but-fully-scripted show can have all that improv energy and wit but also that tighter, more deliberate feel of something scripted. Which I find easier to get immersed in. What lessons have you learned from other shows and applied to Outsiders? I learned from Graham Linehan just how useful it is to be able to tell the story fast, with no details. I call it the ‘anecdote test’. If it’s still funny and interesting when you tell it without dialogue, you’re getting there. It forces you to avoid too much ‘and then…’ plotting – everything comes from something or leads to something. Red Dwarf, among others, made me value character difference, creating a balance that feeds the comedy and stories. You put a chilled slob next to an uptight neat-freak, a guilt-ridden robot next to a selfish animal, you have a great engine right away. Whatever happens, even if it’s just being stuck in a lift, the characters are going to do funny things. And I’ve just been doing Chewing Gum. Michaela Coel has blown me away with her voice. Incidents you’ve never seen on TV, dialogue nobody’s ever said before. It made me realise how easy it is to be generic, how you have to fight that constantly. It’s permission to be freer – to pitch ‘everyone got mugged today’ over ‘the flatmates get into a dispute over the cleaning rota’. • Outsiders episodes 1, 2 and 3, are available to watch at http://comedyblaps.channel4.com. Andrew is on Twitter at @ellardent.